The Washington Capitals and goaltender Philipp Grubauer have agreed to terms on a one-year contract worth $1.5 million as reported by Isabelle Khurshudyan on Thursday. Grubauer was eligible for arbitration but elected to forego that process as he and the team were already close to a deal. Additionally, as Khurshudyan mentioned, Grubauer did not want the Capitals to select a two-year term in arbitration as he preferred a one-year bridge contract, maintaining his restricted free agent status next offseason once his current contract expires. Capitals have re-signed Philipp Grubauer to a one-year, $1.5 million deal. Grubauer was originally drafted by the Capitals in the fourth round of the 2010 NHL Entry Draft and made his debut in the AHL with the Hershey Bears during the 2012-13 season. Posting a 15-9-2 record with a 2.25 goals against average and .919 save percentage, Grubauer also got the opportunity to play in two NHL games that season. With a 0-1-0 record, a 3.57 goals against average and a .915 save percentage, it was clear that Graubauer wasn’t quite ready to make the jump to the next level right away, though the save percentage was encouraging. Playing in 17 NHL games the following season, Grubauer went 6-5-5 with a 2.38 goals against average and a .925 save percentage. Over the last three seasons, he’s played in 46 NHL games and has been the Capitals primary backup in each of the last two seasons. Grubauer’s 2016-17 season was masterful. 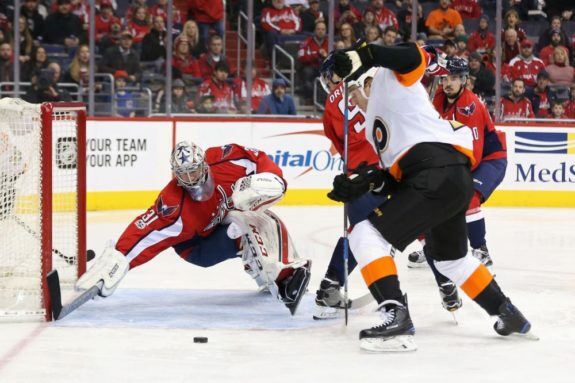 As the Capitals’ backup goaltender, playing behind Braden Holtby, the German-born netminder compiled a record of 13-6-2 and added a 2.05 goals against average and a .926 save percentage last season. Because of this, there was concern that the Vegas Golden Knights would select Grubauer in the 2017 NHL Expansion Draft as the team’s potential goalie of the future. When the Golden Knights ultimately selected defenseman Nate Schmidt, the Capitals fanbase let out a collective sigh of relief that they didn’t lose Grubauer, though the moment was bittersweet as Schmidt was equally as important to the Capitals Stanley Cup aspirations as Grubauer, if not even more important due to the fact that he saw the ice every game whereas Grubauer’s job is to spell Holtby when he needs a night off. After the dust had settled, the Capitals still had to phenomenal goalies who could backstop the team to another successful season, but the team needed to lock up Grubauer with their limited cap space this offseason. After extending T.J. Oshie and Dmitry Orlov to big contract extensions already this offseason, the team was left with Evgeni Kuznetsov, Andre Burakovsky and Philipp Grubauer still awaiting deals. With the latter two locked up to deals, the Capitals’ attention must now turn to Kuznetsov.